Sports guards and bite appliances protect your teeth from injury and damage. 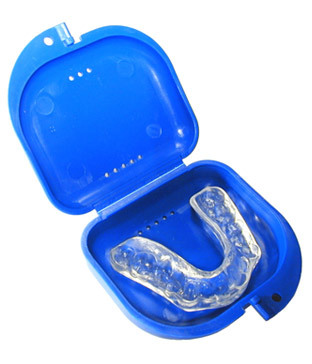 Guards are used to protect your teeth from being chipped, broken or knocked out during sports, and bite appliances (night guards) are used to prevent you from grinding your teeth in your sleep. TranscenDental Group offers custom-made guards that will protect your teeth from these hazards. Sports guards fit comfortably and snugly right over your teeth, but are strong enough to deflect an impact from a frozen hockey puck. Although they provide great protection for high contact sports such as hockey, football and boxing, guards can protect your teeth from damage caused by any sport. Night guards, also called bite appliances, are worn while you sleep to prevent you from grinding your teeth. Nighttime teeth grinding, or bruxism, affects many people. Over time, if your teeth are not protected, grinding can eventually wear down the surface of your teeth and cause serious damage, possibly resulting in lost or broken teeth. A night guard holds your teeth and jaws in place while you sleep, preventing them from moving and stopping you from grinding your teeth. To learn more about ways to protect your teeth with custom made appliances and guards, we invite you to call our office today.